Mom friends are absolutely and totally essential when you’re pregnant. When you have a newborn. When you have a toddler. When you have a child … at any age. You need to feel understood and heard and like you’re not going crazy. You need to commiserate. You need to celebrate. You need advice. OMG, I’ve needed so much advice since becoming a mom. My mom friends have SAVED my sanity so man times. But you know what I’ve also really, really come to realize is a must-have as well? 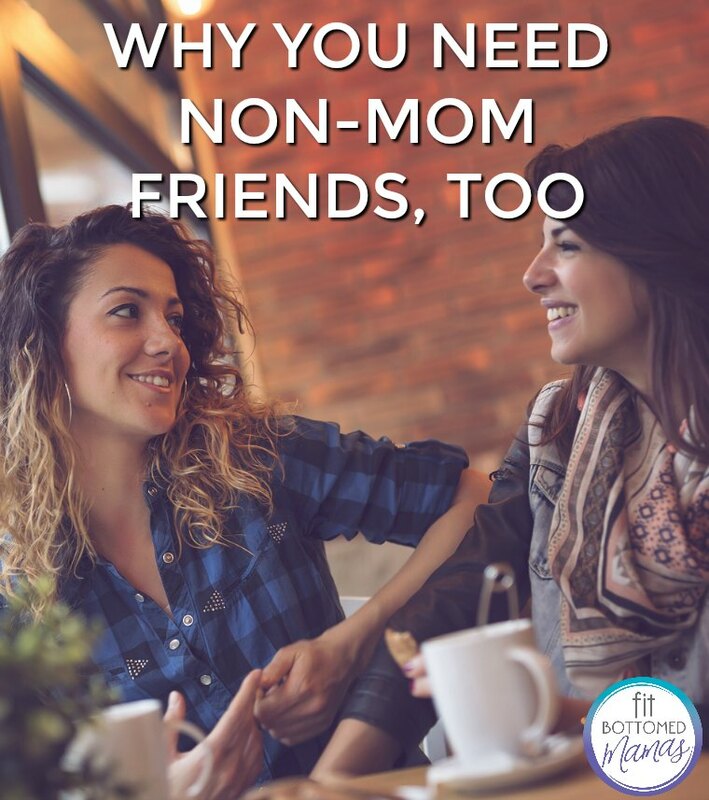 My non-mom friends have been absolutely essential, too, but in totally different ways. Here are five reasons why you’ve just gotta have ’em. 1. Perspective. There is life outside of Peppa Pig. It may not seem like it sometimes, but there is. And your non-mom friend is there to shake you out of the Goldfish-dust-covered shirt you’re in and help expose you to the world beyond life revolving around the kid set. Yes, this perspective may make you nostalgic for your kid-free days when you could sleep in on the weekend and watch whatever television program you wanted at any time, but it can also help you to see that the tantrum that came from giving your little one the wrong colored cup is actually funny … and not necessarily a sign that your child has an ego the size of Texas. 2. Diversity of conversation. While, yeah, you will find humor in lots of kid stories, with non-mom friends, the conversation won’t only be about kids. Because there’s a hell of a lot of stuff happening out there. Politics, events, music, art, fashion … heck, even celeb gossip can be fun. I wouldn’t say I’m exactly “hip” or “trendy,” but my non-mom friends help keep me up on what’s going on. 3. They can usually come to you … and you can hang out without getting a sitter! We are SO lucky in that we have local friends without kids who like our kiddo and enjoy coming over for wine/beer and an easy meal we’ve thrown on the grill. Then, either my husband or I put Gwen to bed, and we stay up listening to music, talking or playing a board game since, you know, they don’t have to get their own little ones home to bed. It’s simple, but it’s fun — and so stress-free and affordable for us. 4. They can save your freakin’ sanity. They really do love you and want to help. They don’t have nap times to worry about or poop explosions (or if they do, they probably need YOUR help) or nap times or cranky little people to work around. And probably they’re even willing and able to pick you up something on the way if you need it. They are magical. 5. It’s awesome to see your kids love your friends as much as you do. They’re your friends for a reason, after all! Some of these friends will be more comfortable with kids than others and want to be involved more than others — so respect that, for sure — but it’s basically like your kids get more aunts and uncles who bring a different dynamic to the relationship specifically because they don’t have children of their own. And that’s pretty sweet. And, for all of those reasons above, it’s essential that you do try to be the best friend possible in return. They know things have changed and demands have changed and schedules have changed, and they’re rolling with it — not along with you, but next to you.